The United States of America just elected its first African-American president. Now, if only college football could be as open-minded. Last week the Institute for Diversity and Ethics in Sports at the University of Central Florida released a report saying that black coaches in major college football are at the lowest numbers in 15 years. Let’s just hope a lot of money wasn’t put into this study because the numbers are obvious. With the ouster of Tyrone Willingham at Washington and now Ron Prince at Kansas State, the number of African-American head coaches at the Division I-A or NCAA Bowl Subdivision level has dropped to four among 119 member schools. Talk about insulting. It’s even worse when you take into account that 55 percent of all student athletes at these schools are minorities. Even with an African-American man in the Oval Office, the old saying that we’re good enough to play but not good enough to coach still rules in major college football. Dr. Richard Lapchick, who co-authored the report, offered a couple of interesting solutions to solve the gap. 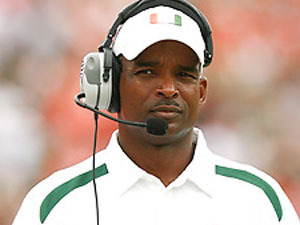 In 1997, there was an all-time high of eight African-American coaches at college football’s highest level. Today, there are just four. The last time the numbers were worse was in 1993, when only three black men held Division I-A head coaching jobs. Lapchick suggests that the NCAA adopt a rule similar to the Rooney Rule in the NFL, which mandates that a minority has to be interviewed for every head coaching vacancy. At the NCAA level, it would be known as the Eddie Robinson Rule as tribute to the late, ground-breaking Grambling coach. Good idea, but very problematic to institute at the collegiate level. Rich white boosters often control the purse strings and haven’t seemed comfortable turning their beloved football programs over to people who look like the players. Then you can’t forget that the NCAA does not exert the same control over its member schools as the NFL does over its teams and players. But this is a serious problem that might require radical measures to solve. How about if the parents of perspective student athletes became a little more proactive and decided not to allow their children to consider those universities that aren’t inclusive in their hiring practices? The information is easy to obtain from the Black Coaches Association. Heck, why can’t the best athletes stock the football programs of our HBCU’s? Trust that the cameras and coverage along with NFL scouts would follow. Just ask Steve McNair and Jerry Rice. My guess is that if white schools lost out on some of the top athletes, who ultimately elevate programs into lucrative BCS paydays, that would get their attention. I remember several years back when Hall of Fame tight end Kellen Winslow and his son (Kellen Winslow, Jr., now a tight end with the Cleveland Browns) had it out on national television on football signing day. Pops wasn’t about to sign any letter of intent to a school that didn’t have an African-American in a position of leadership, either as a defensive or offensive coordinator. Already this year, high-level jobs like Clemson, Tennessee, Washington, Purdue and Kansas State have opened up. Several names are being thrown about. But no African-American coaches seem to be in the mix. Guys like Notre Dame offensive coordinator Mike Haywood and Texas Tech defensive coordinator Ruffin McNeil should be at the top of many lists. But sadly they aren’t. Terrance Harris is a sports columnist for the Houston Chronicle.